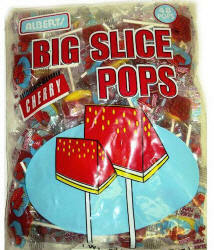 Big Slice Cherry Pops 48ct - $6.50 - Other Albert's Big Slice Pop flavors include Watermelon, Blue Raspberry, Cherry, Strawberry, Peach, Pineapple, Green Apple in 48 pop bags. Once you tear into this yummy wedge-shaped sucker you’ll be smacking and slurping that sweet cherry flavor until there’s nothing left (at which point you’ll promptly run to the nearest mirror to check out your bright-red tongue!). 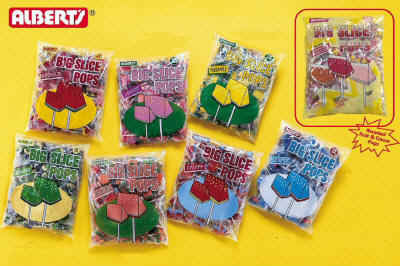 Sugar, corn syrup, citric acid, artificial flavor, artificial colors (red 40, yellow 5, titanium dioxide), soy lecithin.